If there’s one decade that’s seeped into public consciousness of late, it’s got to be the 20s. Not only is the iconic (and Oscar-winning) film The Artist set in this very decade but so is the upcoming adaptation of The Great Gatsby, and where the public goes, fashions follow. We’d all love the chance to enjoy a bit of Hollywood glamour and luckily the high street is full of gorgeous 20s-inspired styles, and it needn’t be that difficult to steal the 20s look. 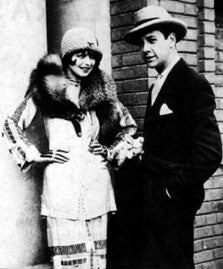 20s fashion is all about decadence, fun and, particularly for women, independence. This was the first time that women were able to dress as they pleased, and with that liberation came drop-waist dresses that showed the leg above the knee (shock horror! ), crop haircuts, racy stockings and embellished headpieces. Art-deco style dresses were all the rage with stunning embellishments, fringing and luxurious materials being the height of fashion, and cloche (bell shaped) hats became particularly popular. It was a fantastic decade for men’s style too. Sharp tailoring was the only way to go, with double-breasted blazers, waistcoats, neck ties and smart suits being the order of the day. As for coats—as well as blazers the long-line coat was most definitely in, and for women the popularity of fur coats soared beyond belief. The 20s look is infinitely glamorous yet can be incredibly wearable, and designers and high street stores alike are catching onto the trend to offer modern shoppers the chance to immerse themselves in the elegance of the Jazz Age. So what are you waiting for? Go and see what 20s inspired fashion you can uncover, and you could even take it one step further by heading to vintage clothing stores. You’ll feel like you’re stepping back in time and will truly look like a 20s style icon, so whip on that flapper dress and get out that double-breasted blazer and you’ll be channeling the perfect 20s look to really make an impression.